NGO private funding outstrips humanitarian financing from some of the world’s largest government donors, says a recent report by UK think-tank Development Initiatives (DI). But the volatile nature of the private funding base, particularly in periods of economic downturn, worries some NGO fundraisers. Fifty-one percent of humanitarian funding for 114 NGOs studied comes from private sources. As a result, an NGO such as Médecins Sans Frontières (MSF), which channeled US$495 million to emergency response in 2006, outspends the humanitarian budgets of 20 individual government donors, including France, the Netherlands, Germany and Norway. 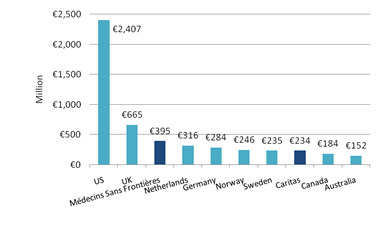 MSF France spent $81 million of French private citizens’ money on humanitarian crises in 2006, compared to $48 million spent by the French government. And MSF is outspent only by the two largest Organisation for Economic Cooperation and Development (OECD) donors, the United States and United Kingdom. The report studied NGO and donor humanitarian financing in 2006, analysing the funds of 30 donor members of the OECD, and 114 NGOs across 23 countries. The NGOs include 19 of the world’s largest humanitarian non-profit networks or families such as Oxfam, CARE, MSF, Save the Children and World Vision. 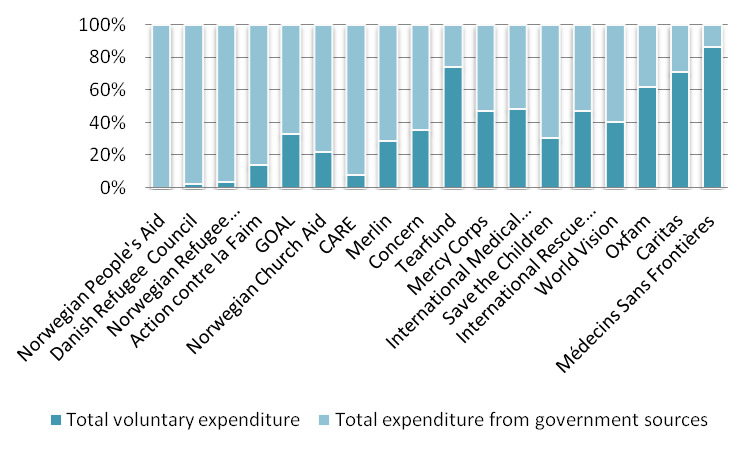 Together these NGOs spend 60 percent of global humanitarian funding. It did not analyse money sent via remittances, from host communities or donations for non-emergency purposes. Some NGOs are far more reliant on private giving than others: Norwegian People’s Aid receives one percent from private donors, while MSF receives 86 percent. This comes down partly to respective countries' funding habits; Scandinavian donors for instance, give proportionally high percentages of annual income to humanitarian assistance, and channel much of it through NGOs. It also intertwined with NGOs’ cultural and philosophical origins, which humanitarian think-tank the Overseas Development Institute (ODI) has split into three categories: religious, Dunanist, or Wilsonian. Dunanist organisations such as the International Committee of the Red Cross, MSF or Save the Children, position themselves outside of state interests; Wilsonian organisations see US values and influence as a force for good; and religious NGOs such as the Caritas network derive much of their funding through religious institutions. DI’s study was undertaken in a humanitarian aid climate in which bilateral and multilateral donor funding for emergency response has been on a steady increase over the past several years, according to humanitarian finance expert Abby Stoddard. The number of emergencies has also increased, says the International Federation of the Red Cross; in 2007 the number of UN and NGO emergency appeals was more than double that in 2000. Walmsley was unable to say whether private giving to NGOs has increased in recent years. In the UK the Disasters Emergency Committee, an NGO network that raises money from UK members of the public for NGO emergency response, shows its figures are inconsistent – the 2004 tsunami bringing in $538 million, versus the latest 2009 appeal for Gaza residents, attracting just $9.7 million. NGO representatives say private funds allow them to respond quickly – within hours or days rather than weeks – to sudden crises and often finance the initial response phase before they have issued their own or a collective appeal. Up to 65 percent of DAC donors took six weeks to disburse funding for emergencies in 2006 according to DI’s 2008 Good Humanitarian Donorship Indicators Report. Private funds allow NGOs to safeguard their independence from governments and are more flexible, aid officials say. “The chief advantage is you can move very quickly and you can use the money for anything you need,” said Janet Harris, vice-president of development for the International Rescue Committee, whose emergency funding is 47 percent private, according to the DI report. With unrestricted funds NGOs can help set the donor or media agenda rather than being driven by it, Harris said. “We can detect and reveal a problem [with private sources] that official sources will then pick up on,” Harris continued, pointing out programmes IRC launched to address violence against women in the Democratic Republic of Congo, that triggered donor funding. According to DI’s research, NGOs spend a higher proportion of private contributions on Africa than DAC donors – at 57 versus 46 percent, and much less on the Middle East – at three versus 15 percent. But heavy reliance on private donors is risky because on a daily basis they are more volatile than institutional donors, Harris said. “It [private giving] is more subject to sudden shifts in headlines in the economy. People tend to be more spontaneous in their giving, and the lack of predictability is one of our biggest management problems." The global economic crisis is hitting private donations hard, causing many dependent NGOs such as Oxfam to downsize. IRC’s private donations are expected to have shrunk by 10 percent in the 2008-09 fiscal year, said Harris. Meanwhile many of the biggest institutional donors have pledged they will do all they can to maintain their humanitarian budgets. Caritas, a network of 162 NGOs whose humanitarian funding is equivalent to the Swedish government's, also expects a fall in private donations across its network. “There is a commitment to keep frontline services up and running at the same funding levels, which will mean cuts in other areas such as education or advocacy campaigns,” warned spokesperson Patrick Nicholson.